How to TELL TIME in SPANISH - FREE LESSON!!!! 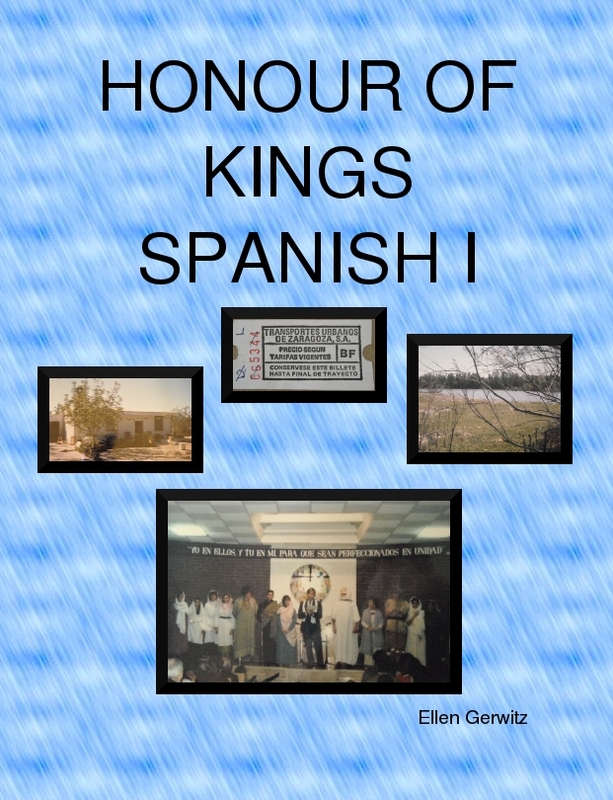 Honour of Kings is pleased to give you a free lesson from their new Spanish curriculum: Spanish I. In this lesson, we'll learn to TELL TIME in Spanish. If you have never learned how to tell time on a traditional, analog clock, you may find this lesson a little bit more challenging. It might be a wise idea to brush up on that skill before continuing. The first rule to know when telling the time is that we use the verb SER. We learned this in the previous lesson, but we'll actually see it in use in this lesson. The second thing you must know before you can tell time is the names of each hour. These words are : una, dos, tres, cuatro, cinco, seis, siete, ocho, nueve, diez, once, and doce. Notice that the word for the hour 1 is una, but the word for the number 1 is uno. The rest of the words are the same as the words for the numbers 2 to 12. Now, this may be obvious, but the hour 1 (UNA) is a singular subject because there is only one hour. However, the hours 2 to 12 are plural subjects because they each have more than one hour. This tells us how to conjugate the verb SER. For the hour 1 (UNA), we use the conjugation ES, which is the third person singular. For the hours 2 to 12, we use the conjugation SON, which is the third person plural. Es la una. (The hour) is one. It is one o'clock. Son las dos. (The hours) are two. It is two o'clock. Son las tres. (The hours) are three. It is three o'clock. Son las cuatro. (The hours) are four. It is four o'clock. Son las cinco. (The hours) are five. It is five o'clock. Son las seis. (The hours) are six. It is six o'clock. Son las siete. (The hours) are seven. It is seven o'clock. Son las ocho. (The hours) are eight. It is eight o'clock. Son las nueve. (The hours) are nine. It is nine o'clock. Son las diez. (The hours) are ten. It is ten o'clock. Son las once. (The hours) are eleven. It is eleven o'clock. Son las doce. (The hours) are twelve. It is twelve o'clock. If we wish to say it is exactly an hour on the dot, we can add the words "EN PUNTO." Es la una en punto. It is exactly one o'clock. / It is one o'clock on the dot. Son las dos en punto. It is exactly two o'clock. / It is two o'clock on the dot. Of course, it is not always exactly at the top of the hour when someone asks you the time. You must also learn how to explain how minutes have passed since the top of the hour or how many minutes remain until the top of the hour. Let's start with explaining how many minutes have passed since the top of the hour. Let's imagine it is 1:10. In English, we would simply say the two numbers like this: one ten. However, some people might also say this : ten minutes after one. In Spanish, it's a little different. They say it like this: one and ten. You can do this for any of the minutes between 1 and 29. However, once you get to 30 minutes past, the rules change. Es la una y dos. It is 1:02. Son las dos y cinco. It is 2:05. Son las tres y diez. It is 3:10. Son las cuatro y doce. It is 4:12. Son las seis y veinte. It is 6:20. Son las siete y ventidos. It is 7:22. Son las ocho y venticinco. It is 8:25. Son las nueve y ventiseis. It is 9:26. Son las diez y ventisiete. It is 10:27. Son las once y ventiocho. It is 11:28. Son las doce y ventinueve. It is 12:29. Once we reach the 30 minute mark, we are half-way through that hour. Thus, in Spanish, they use the word for half which is MEDIA. Give the name of the hour that just passed and follow it with the words for and and half. Son las dos y media. It is 2:30. Son las tres y media. It is 3:30. Son las cuatro y media. It is 4:30. The last part of telling time in Spanish is probably the one most people find different than in English. Let's examine a few given times and how we would normally say them in English first. The second English method we looked at is closer to the Spanish method. For any minutes between 31 and 59, you must first give the hour THAT IS COMING, followed by the word for minus (MENOS), and then the number of minutes that remain until you reach the top of the hour. 9:35����������������� Son las diez menos venticinco.��������������� It is ten minus twenty-five. 10:40��������������� Son las once menos veinte. � � � � � � � � � �� It is eleven minus twenty. 11:45��������������� Son las doce menos cuarto.��������������������� It is twelve minus a quarter. 12:50��������������� Es la una menos diez. � � � � � � � � � � � � � � �� It is one minus ten. 1:55����������������� Son las dos menos cinco.������������������������� It is two minus five. Note that we also used the word CUARTO (quarter) to indicate 15 minutes until the top of the hour. As a review, let's look at various times between two and three o'clock. 2:00�������������������� Son las dos en punto. � � � � � �� It is two o'clock. 2:05 ������������������ Son las dos y cinco. � � � � � � � �� It is five minutes after two. 2:10 ������������������ Son las dos y diez.������������������� It is ten minutes after two. 2:15������������������� Son las dos y cuarto.������������� � It is quarter after two. 2:20������������������� Son las dos y veinte.������������� � It is twenty minutes after two. 2:25������������������� Son las dos y venticinco.������� It is twenty-five minutes after two. 2:30������������������� Son las dos y media.�������������� It is half-past two. 2:35������������������� Son las tres menos venticinco. It is twenty-five minutes until three. 2:40������������������� Son las tres menos veinte. � � � � � � It is twenty minutes until three. 2:45������������������ Son las tres menos cuarto. � � � � � �� It is quarter to three. 2:50������������������ Son las tres menos diez. � � � � � � � It is ten minutes until three. 2:55����������������� Son las tres menos cinco. � � � � �� It is five minutes until three. 3:00����������������� Son las tres en punto.������������������ It is three o'clock. A. Write the correct Spanish phrase after the given time. B. Express the following time using digits. Write the Spanish phrase first, then the digits. C. Write the correct time after the given Spanish phrase. Write the Spanish phrase first, then the digits. D. Write the time in Spanish using words. E. Translate the following sentences. Write the English sentence first, followed by the Spanish sentence. 1. It's quarter to ten. 2. We eat dinner at 5:30. 3. The airplane arrives at 4:40. 4. They finish at 9:20. 5. I study at half past eight. F. Translation: MI VIDA: Write the Spanish sentence first and then the English sentence. Estudio ingl�s, historia, ciencia, biolog�a, matem�ticas y espa�ol. Los cursos no son dif�ciles. Empezo mi trabajo a las nueve y termino a la una. Ayer por la ma�ana, no hice (past tense of hacer) escuela. Pero esta ma�ana, necesito hacer mucho trabajo. En historia, aprendo cosas tocante a los Estados Unidos. En ingl�s, estudio los sujetos, los verbos, y la literatura. En espa�ol, necesito contestar preguntas como "�Cu�l es tu direcc�on?" y "�Cu�ntos a�os tiene usted?". Are you looking for a Spanish I course for your teenager? Do you wish it was taught by a real teacher instead of a computer? Don't want to drive long distances or pay a lot of money per week to study Spanish? I have the solution! I am offering a distance-learning (via email) Spanish I course which will begin in February and run through August. (Spanish II will begin in Sept 2013.) This course is a full-year course and the equivalent of one high school credit in a foreign language. It includes 27 weeks of instruction, seven tests, and a final exam. All lessons, corrections, and grading are done by me. All you have to do is to make sure your student receives, completes, and submits the assignments. Feel free to send me a message with any questions you may have. I'm happy to answer them. I've been teaching this course to local homeschool students for the past eight plus years. You'll find both a digital and print version of the text and it key to give you more options.